We have spent the last three days helping out in various classrooms in the surrounding communities. Our students have been out and about supporting the students and teachers at Coke’s View Primary School, the Galloway Early Childhood Institute, Ferris Primary School, and the Petersfield Primary and Infant School. It certainly has been a rewarding (and challenging) few days for our students. Over they last three days, they have assisted teachers in the classrooms, graded papers, gave the students some much needed one-on-one support, and interacted with the hundreds of students attending these four area schools. The classroom environment is quite different than the US education system. Class sizes can often be as large as 55 students. Imagine trying to run a classroom with over 50 first graders! The classrooms are in long buildings, with chalkboards used to divide the different classes. You can hear students from several different classes at all times. And there was an overwhelming lack of resources. Paper and pencils were so scarce, that children would often have to share. This was a real shock to our participants. How can these children hope to reach their potential when they can’t event write down an assignment? As part of the preparation for our trip, we all read the book “Start Something That Matters,” which became the motto and mentality for our trip. After reflecting on our shared experiences, our students began brainstorming ways that we could continue to impact this children and this community long after we leave. We are very excited about some of the opportunities we’ve been discussing, and we will see how they begin to unfold in the coming weeks. As we left today, our students were thanked, celebrated, hugged, and missed. Tears were shed, and hopefully, lives were changed. 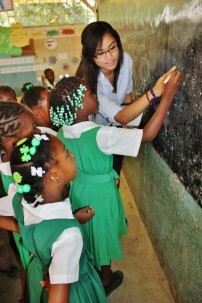 The time spend in the classrooms here in rural Jamaica will be with many of us forever. As our trip winds down to a close here at the end of the week, we look forward to finishing strong, and making the most of every moment we have here in Jamaica.